The very first thing that strikes you about A House for Mouse is the beautifully illustrated cover and the quality of the book jacket. This is definitely a book you would be drawn to pick up and thumb through on sight to see if it is as glorious inside as the outside cover advertises. The story starts with a little mouse who decides he needs to leave his home in the tree and explore the land around him. His trek through Fairy Tale Valley will show him that not every potential house he finds will make a good home. The straw house could be blown down with a “Huff” and a “Puff,” Rapunzel’s tower had no door to be found, and an Old Woman’s shoe was too crowded with noisy inhabitants! While the rhyming prose is well thought out and a perfect story to read aloud, the illustrations were a bit underwhelming in color and content. There wasn’t a focal point in any of the illustrations to draw your eye and it was hard to figure out what was going on without the text to tell you. The scenes and characters, although charming, were too tiny and scattered on the vast pages to be given much notice. There was one page that didn’t rhyme well and makes one wonder if it was perhaps a typo. “Then he peeped through a window and saw all the toys . . . There were so many children and oh what a no!” Instead of “no,” the word “noise” would have been the perfect word to describe the chaotic illustration of too many children in the shoe. The story, which had been rhyming along nicely, came to an abrupt stop and it was hard to get back into the rhythm of the story. 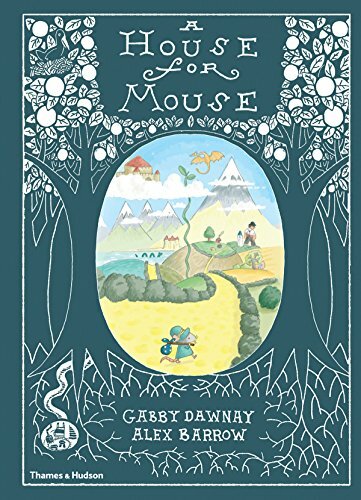 The fairy tales interwoven throughout the story are familiar, and children will be able to anticipate what will comes next, but A House for Mouse felt like a rough draft that was hurriedly sketched out to meet a last-minute deadline. The beautiful cover on the outside of the book leaves one feeling disappointed at the contents inside the book. Three stars.